One of the main benefits of working with Git is the ability to split code into branches and work on those branches in parallel. By integrating your Git branches into your Puppet workflow, you can present each Git branch as a Puppet environment to separate your dev, test and prod environments in different code branches. 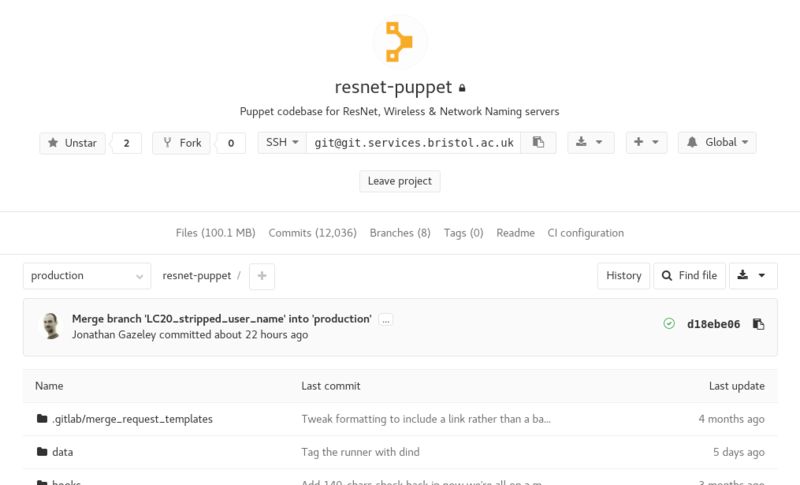 This guide assumes you already have a working Puppet master which uses directory environments, and a working Gitlab install. It assumes that your Puppet and Gitlab instances are on different servers. 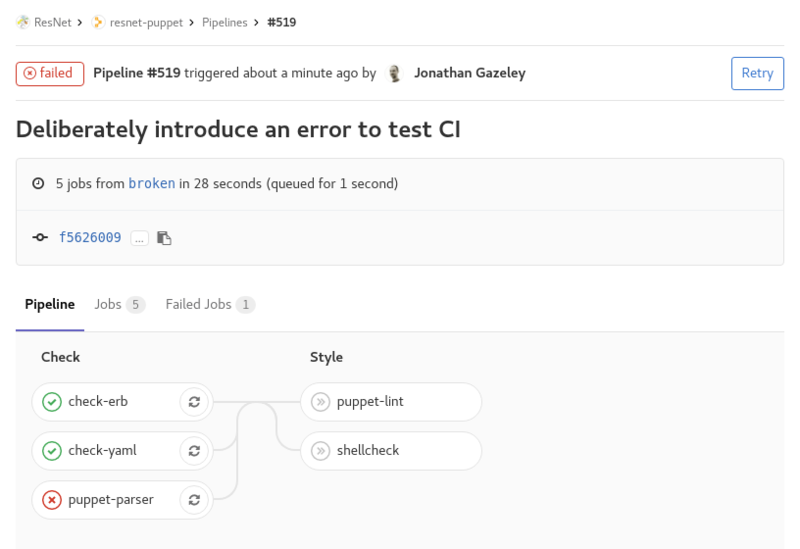 It’s recommended that you install Gitlab with Puppet as I described in a previous blog post. The basic principle is to sync all Puppet code from Gitlab to Puppet, but it’s a little more complex than this. When code is pushed to any branch in Git, a post-receive hook is executed on the Gitlab server. 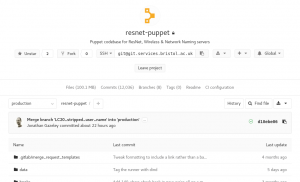 This connects via ssh to the Puppet master and executes another script which checks out the code from the specific Git branch into a directory environment of the same name. First you need to create a deploy key for your Puppet Git repo. This grants the Puppet master read-only access to your code. Follow these instructions to create a deploy key. You’ll need to put the deploy key in the home directory of the puppet user on your Puppet master, which is usually /var/lib/puppet/.ssh/id_rsa.pub. The puppet-sync script is the component on the Puppet master. This is available from Github and can be installed verbatim into any path on your system. I chose /usr/local/bin. You’ll need to create a pair of SSH public/private keys to allow your Gitlab server to ssh to your Puppet server. This is a pretty standard thing to do, but instructions are available on the README for puppet-sync. 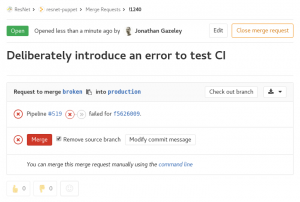 The post-receive hook must be installed on the Gitlab server. The source code is available from Github. You will need to modify the hook to point at the right locations. The following values are sensible defaults. Now all the components are in place, you can start to use it (when you’ve tested it). Gitlab’s default branch is called master whereas Puppet’s default environment is production. You need to create a new branch in Gitlab called production, and set this to be the default branch. Delete master. When you’re happy, send a merge request to merge your branch back into production. 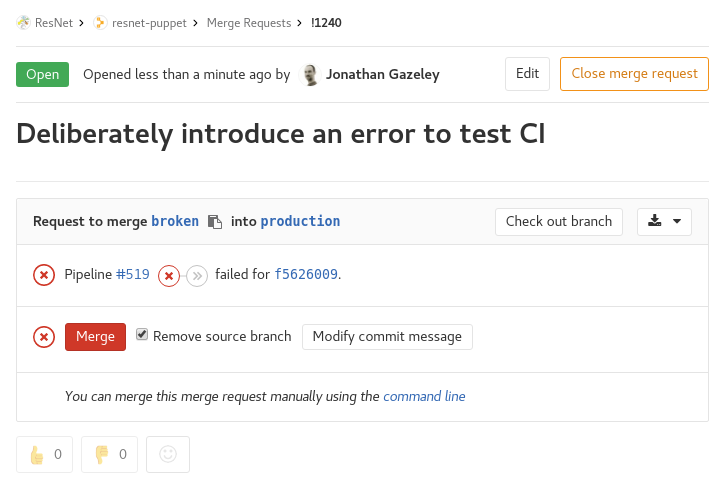 When the merge request is accepted, the code will automatically be pushed to the Puppet server. 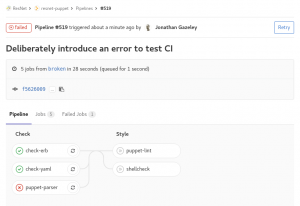 Read about this in more detail: Gitlab Flow. Mark wrote a useful post about building mod_auth_cas for CentOS 7. It works, but I prefer to build RPM packages on a build server and deploy them to production servers, rather than building on production servers. Basically I took the spec file from the mod_auth_cas source package for CentOS 6 from the EPEL 6 repository, tweaked it, and replaced the source tarball with the forked copy Mark recommended. 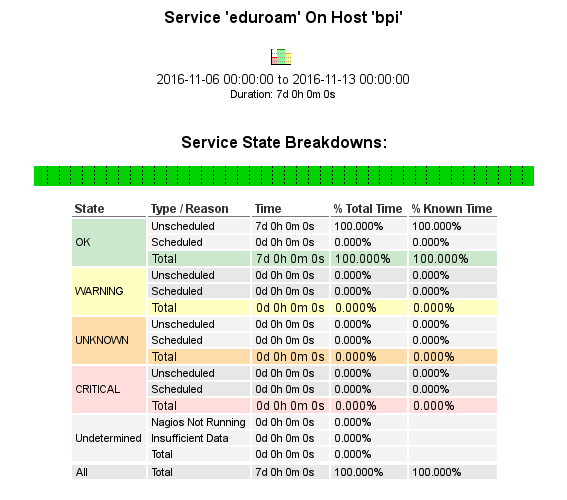 This built cleanly for CentOS 7. There’s an even better way of building this for CentOS 7. Fedora 21 includes Apache 2.4 and mod_auth_cas and it is really easy to backport this source package. First grab the latest version of the source package from the Fedora mirror onto your CentOS 7 build server. Always make sure there isn’t a newer version available in the updates repo. It will spit out an RPM file suitable for deployment on CentOS 7. Add --sign if you routinely sign your packages with an RPM-GPG key. 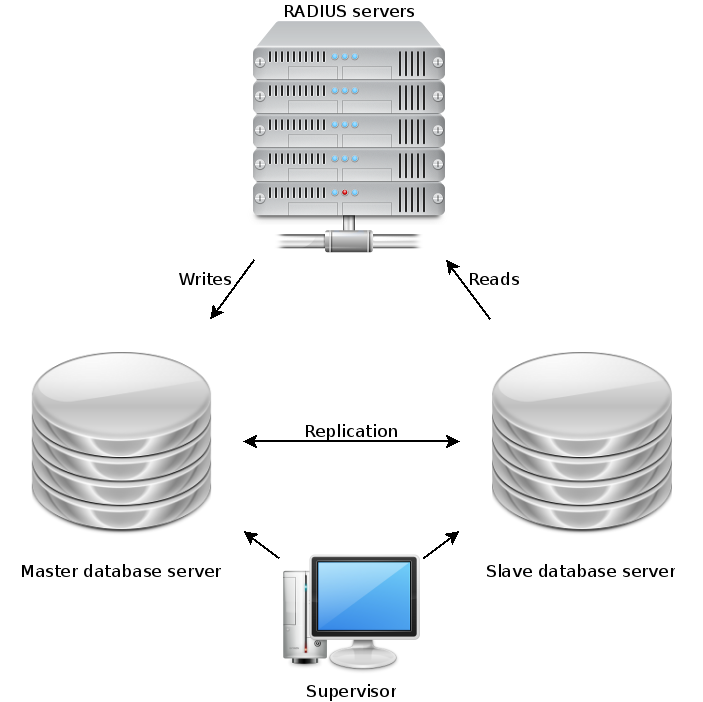 I’ve revisited the way that we at ResNet deploy our web applications to web servers. We decided to store the application code in a Git repository. As part of our release process, we create a tag in Gitlab. Rather than check the code out manually, we are using a Forge module called puppetlabs/vcsrepo to clone a tagged release and deploy it. Our app repos do not permit anonymous cloning so the Puppet deployment mechanism must be able to authenticate. I found the documentation for puppetlabs/vcsrepo to be a bit lacking and had spend a while figuring out what to do to make it work properly. I recommend you generate a separate SSH key for each app you want to deploy. I generated my key with ssh-keygen and added it to Gitlab as a deploy key which has read-only access to the repo – no need to make a phantom user. I’ve started publishing as many of my Puppet modules as possible on Puppet Forge. It isn’t hard to do but there are a few things to know. 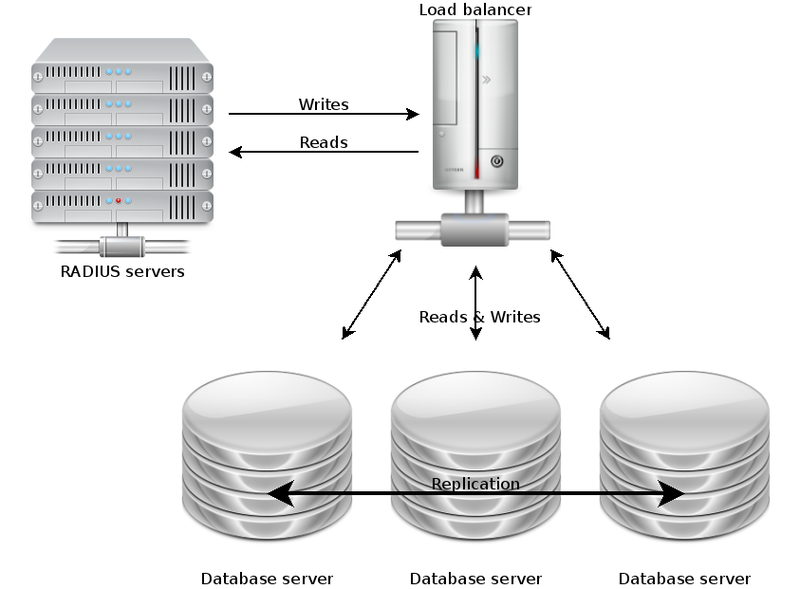 This guide is largely based on Puppetlabs’ own guide Publishing Modules on the Puppet Forge. For home-grown modules that have grown organically, you are likely to have at least some site-specific data mixed in with the code. Before publishing, you’ll need to abstract this out. I recommend using parametrised classes with sane defaults for your inputs. If necessary, you can have a local wrapper class to pass site-specific values into your module. The vast majority of Puppet modules are on GitHub, but this isn’t actually a requirement. GitHub offers public collaboration and issue tracking, but you can keep your code wherever you like. Before you can publish, you need to include some metadata with your module. Look at the output of puppet module generate. If you’re starting from scratch, this command is an excellent place to start. If you’re patching up an old module for publication, run it in a different location and selectively copy the useful files into your module. The mandatory files are metadata.json and README.md. When you’re ready to publish, run puppet module build. This creates a tarball of your module and metadata which is ready to upload to Puppet Forge. Create an account on Puppet Forge and upload your tarball. It will automatically fill in the metadata.